Not only am I returning to blogging, I’m looking forward to leaving this freezing winter behind, ready to catch the end of the European summer. In a few weeks I’ll be exploring Eastern Europe, and the closer it gets the more I find myself wanting to use this trip as a way of improving myself, as well as experiencing all of what Europe has to offer. It’s been five years since I’ve travelled solo outside of my state. While I’ve taken many trips with friends and family, there’s something freeing about going on your own. 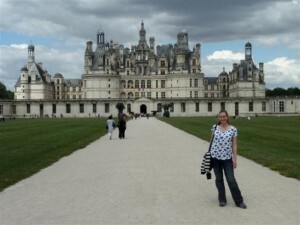 While I’ll be joining some group tours along the way, and I’ll have my fellow tour group members to go exploring with, I also want to take the time to make sure I experience the things that interest me most about the places I’m going to. I feel like it’s easier to break away from a tour group and do your own thing than it is when travelling with friends and family. It’s also a way of clearing my mind from what has been a busy and stressful first half of 2018. About three-quarters through a trip, my mind has usually quietened and found enough space to relax and it becomes quite clear about what I need to do when I get back home. I identify as a minimalist, and have been actively culling my possessions down to only those I love or use, ever since it first sunk in that the less things you own, the easier it is to travel. While I’ll never be able to fit everything I own into one backpack, one area I really struggle with is taking too many clothes with me. My suitcase is full before I leave Australia. I want this year to be different. I did a trial pack for my seven week trip the other week, pulling all of the clothes out of my cupboard and packing them into my suitcase. I ended up with three pairs of jeans, two pairs of trousers, three skirts, three dresses, and thirty tops. I know I try to avoid doing as much laundry as possible whilst I’m away, but this was kind of excesive. At the same time, I’ve read a lot about people using packing cubes to organise their luggage while travelling. I didn’t quite understand it, and wrote it off in my head as something I didn’t need, but after seeing how many clothes I was trying to take away with me, I managed to get some on sale from Kathmandu, and am challenging myself to only take away with me the clothes that fit into one of their large packing cells. I’ll let you know how successful I am in a later post! I’m spending four days on this trip in Vienna, and as a challenge to myself I want to spend it speaking only German. I learned German in high school and have kept it up with a few refresher classes since, but immersing myself in a German-speaking city will help me with my confidence with speaking the language. Watch out for a post on how well I managed! 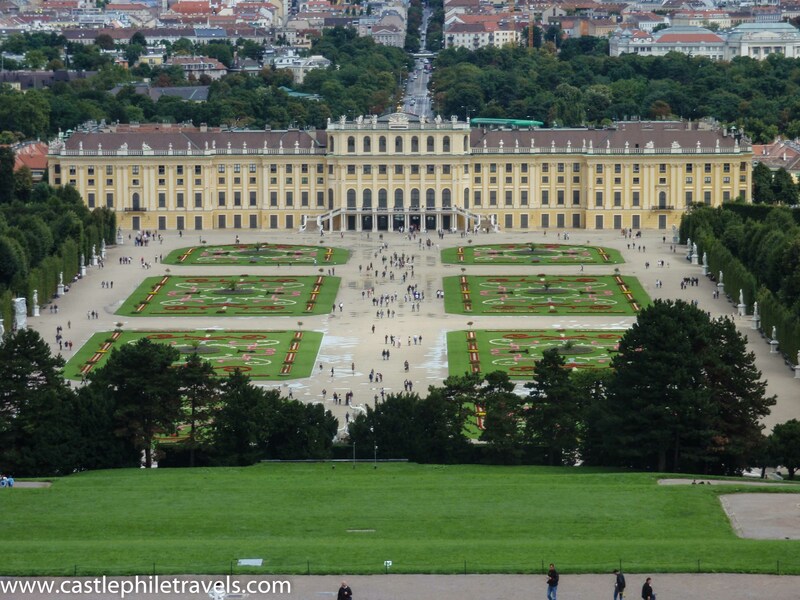 This trip sees me travelling around Eastern Europe, including visiting Vienna, Prague and Budapest. I’ve been to these cities before back in 2010, however I never felt like I took the time to fully understand them. There are many reasons for that including that a few days earlier I had walked into a pole in Salzburg, which meant I had to walk around Vienna and Budapest feeling self-conscious about the plasters on my forehead marking my head injury, and then had to spend half of my time in Prague waiting in a doctor’s office so I could have the stitches taken out. It rained constantly in Budapest, reflecting my miserable mood, so after exploring the Grand Central Market and having a Tokay wine tasting, I spent the rest of the time catching up on sleep at the hotel. 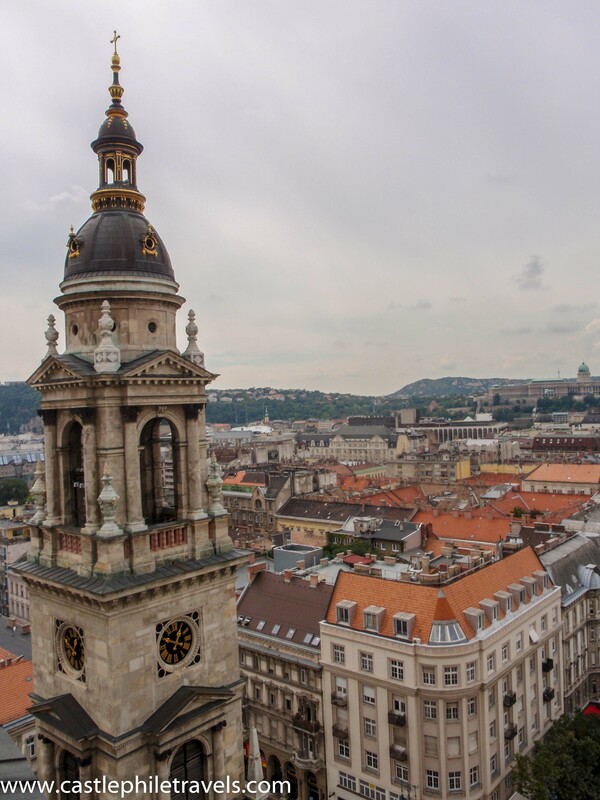 I looked at my photos of Budapest the other day and was amazed at how pretty the buildings were – I was in such a bad mindset at the time that I hadn’t even noticed. This trip I want to spend some time admiring these capital cities for the magnificent places that they are. If you’re heading to the City of Light this July, you might have heard of the Paris Museum Pass – a multi-day pass giving you entry (and in some places the ability to bypass the queues) to more than sixty museums, art galleries, and monuments in and around Paris. While you can buy it online, if you’re anything like me, you might not make up your mind about the Paris Museum Pass until after your plane has landed at Charles de Gaulle. If you find yourself in Paris before you’ve had a chance to order a pass online, should you rush out to get it? And where can you get your hands on one when you’re on the ground in Paris? Is the Paris Museum Pass worth it? 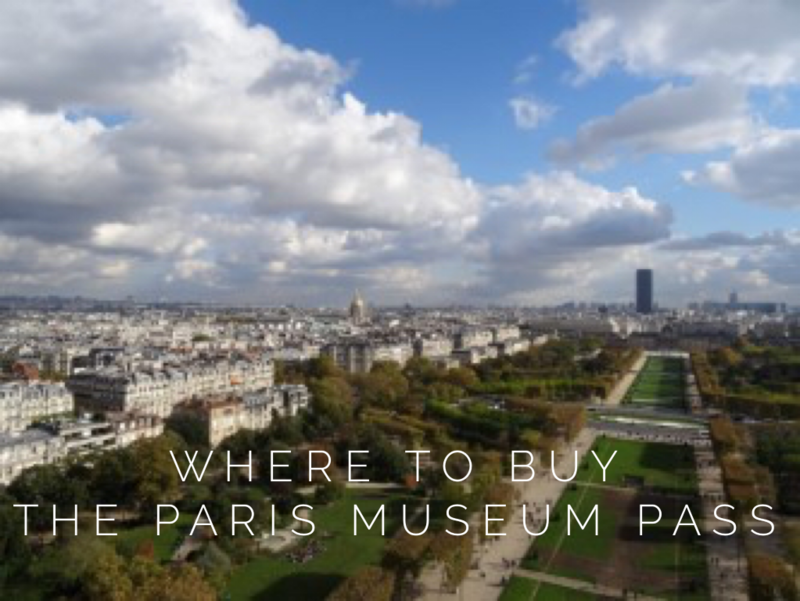 Where can I buy the Paris Museum Pass? You can buy the Paris Museum Pass online, or according to the Paris Museum Pass website it can be bought at the ticket desk of most museums. From the tourist information stand in front of Notre Dame de Paris. In July 2012 I purchased a Paris Museum Pass from a tourist information stand outside of the Cathedral of Notre Dame de Paris. The stand might only be set up during the peak tourist season – when I returned to Paris in November it wasn’t there. From the Museum’s membership centre on the Allée du Grand Louvre. We tried buying a pass from the Louvre ticket desk, and they sent us to the membership centre, in between the large pyramid and the Galerie du Carrousel arcade. They also offer Friends of the Louvre memberships here, if you think you’ll come back to the Louvre often. Have you bought the Paris Museum Pass? Where did you buy it from? Did you think it was worth it? Let us know in the comments! It started off simply. I had a thirty-six hour window of time in Berlin. I wanted to explore another part of the city, away from the tourist sights and the shops around Tauentzienstraße. What could I do that was different? I tried to think of things that would take me away from Alexanderplatz and Unter den Linden, without feeling like I was wandering around aimlessly. I ended up compiling a list of palaces, fortresses and stately homes that were scattered across Berlin and challenged myself to a scavenger hunt: to see as many of the places on my list as I could in the one and a half days I had in Berlin. 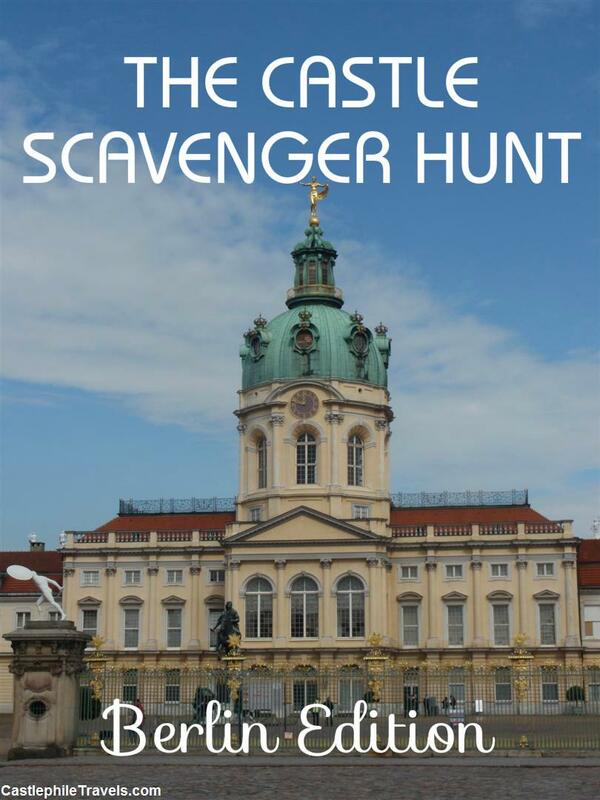 I set off on my expedition on the afternoon that I arrived in Berlin and headed for the familiar street of Unter den Linden to begin my scavenger hunt at the Brandenburg Gate. 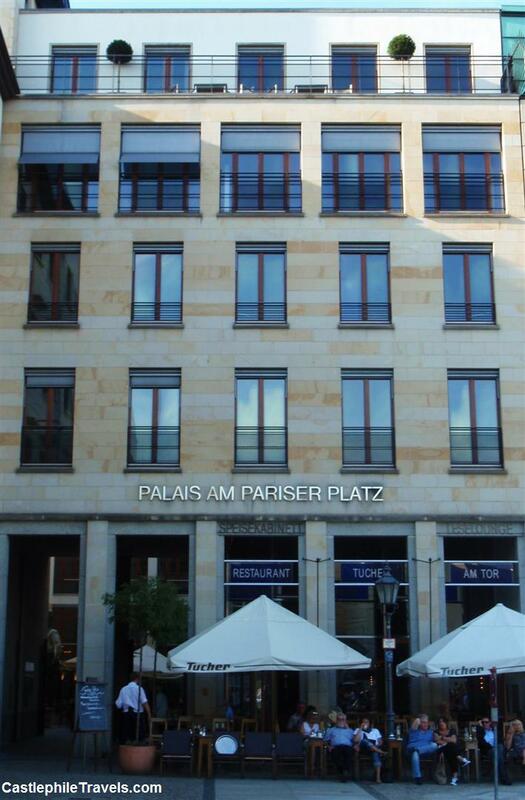 I quickly found the Palais am Pariser Platz tucked in next to the Brandenburg Gate. Built in the late 1990s, the office building wasn’t quite what I was picturing when I thought of the word ‘Palais’ but it gave me an excuse to see the Brandenburg Gate again (something to redeem my seventeen year old self’s disappointment at visiting while the Brandenburg Gate was being restored ). Undeterred, I continued on under the Brandenburg Gate and through the Grosser Tiergarten to the next location on my list. Home to the President of Germany, Schloss Bellevue is one palace that is off-limits to casual scavenger hunters. While here, I took side trips to the nearby Siegessäule (Victory Column) and the Reichstag, before turning back and making my way down Unter den Linden towards Museumsinsel. The last building on my list before I began to venture in to unknown territory was the Palais am Festungsgraben (Palace on the Moat). 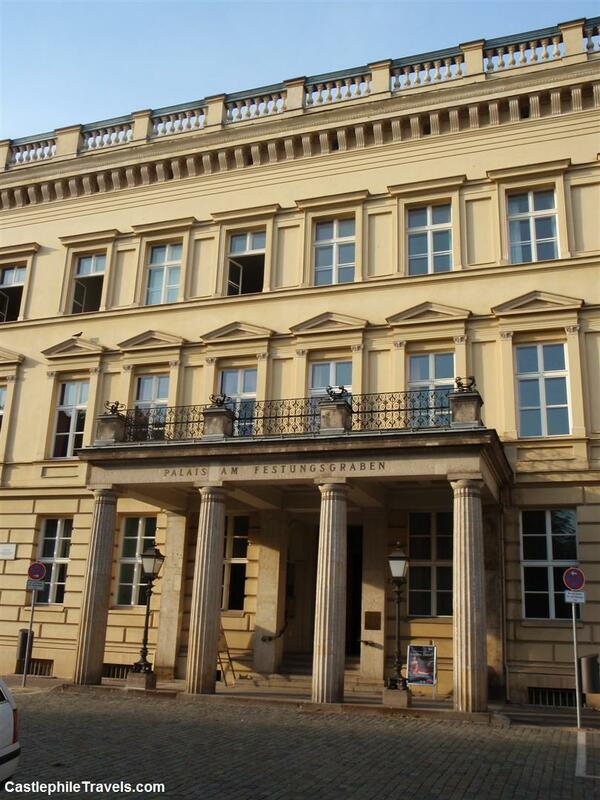 Once the Prussian Finance Ministry, the Palais now houses the Saarländische Galerie and the Theater im Palais. After spending some time in the Berlin I’m most used to hanging out in, it was time to explore somewhere new. I crossed on to the other side of the River Spree, and found myself in the Nikolaiviertel, where my DK Eyewitness Top 10 Travel Guide: Berlin book told me I’d find Knoblauchhaus and Ephraim-Palais. While I didn’t go inside Knoblauchhaus, which is now a museum displaying the life of an upper-middle class eighteenth century family, the streets surrounding it were lovely to stroll around complete with cobblestones and homes that looked like they had appeared out of a Brothers Grimm fairytale. 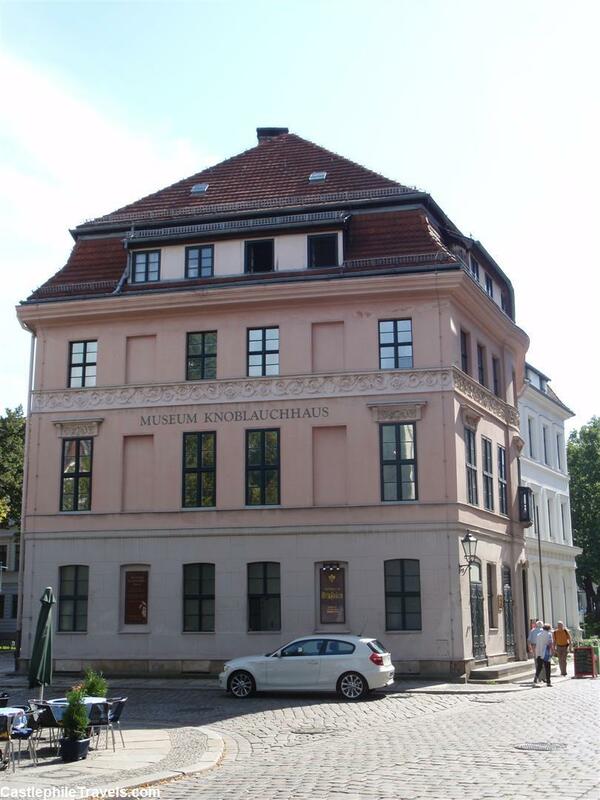 The biggest surprise of the Nikolaiviertel was Ephraim-Palais, a curved building on the corner of Poststrasse and Grunerstrasse housing an art gallery. 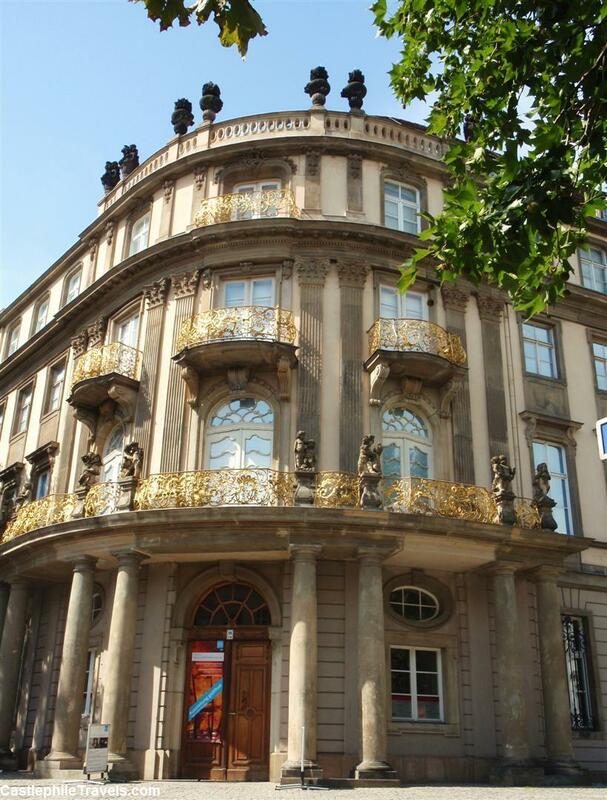 King Friedrich II’s jeweller, Veitel Heine Ephraim, had the palace built in the 1760s and it would have been an impressive residence, judging by the golden balustrades and the detail on the sculpted cherubs. The next morning, I jumped on the U-bahn and took the U7 line all the way out to Spandau – almost the last stop on the line. The Zitadelle Spandau was quite easy to find, and armed with an audio guide, I spent half the day exploring its towers, museums and halls. 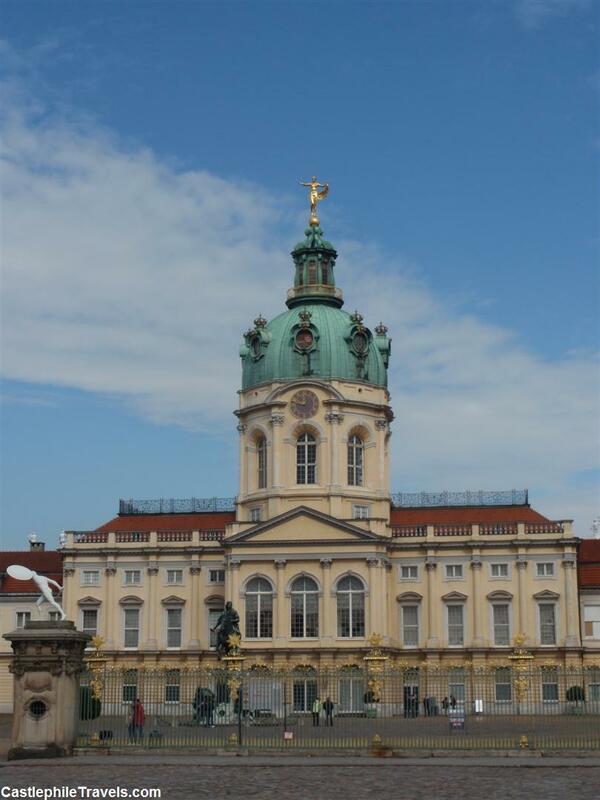 I left the grounds of Schloss Charlottenburg – my favourite place in Berlin – until last, knowing I could chill out in the peaceful gardens before returning to my hotel and preparing to leave Berlin. I wasn’t able to race around to every place on my list, but that means there are more places to explore the next time I’m in Berlin. Here’s the list of the sights I missed, if you’d like to search for them yourself! While I enjoyed discovering new areas of Berlin and re-visiting old favourites, the only place I had time to really explore was the Spandau Zitadelle, which I wouldn’t have ventured out to without the challenge of this scavenger hunt. The next time I’m in Berlin, I’ll make sure to spend a morning wandering around Nikolaiviertel, and perhaps even go on a second scavenger hunt to see the rest of the places on my list! Have you attempted a scavenger hunt while travelling? You can’t miss Edinburgh Castle. 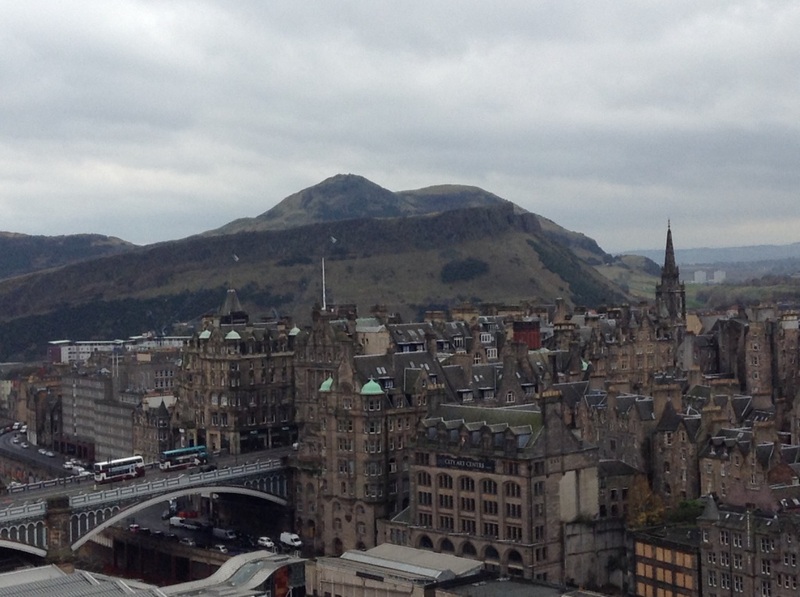 Perched high on a volcanic plug at the top of the Royal Mile, it looks over the city of Edinburgh. The moment after I had checked in to my hotel and dropped my bags on the floor, I made a beeline for it. I knew nothing about the castle, apart from glimpses of it serving as the backdrop for the Edinburgh Military Tattoo. 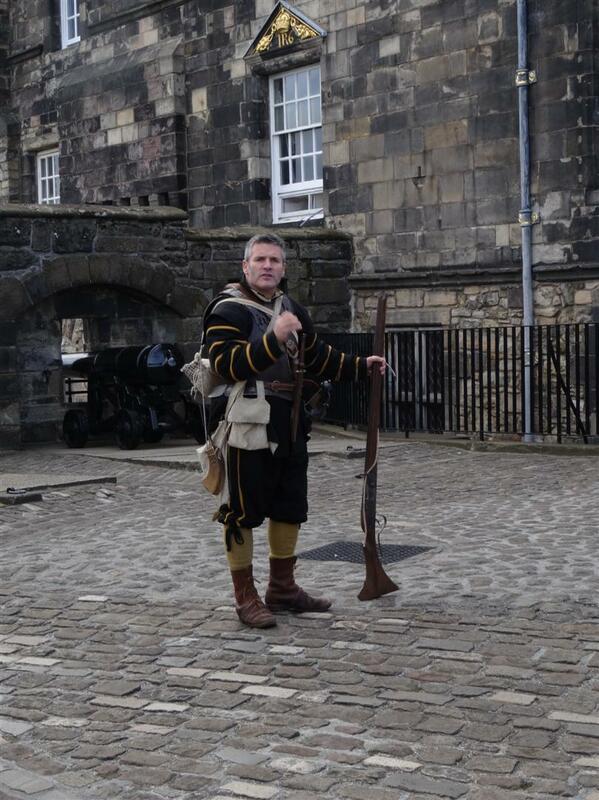 Little did I know that it has been a royal residence since the 11th century when King Canmore and his queen, Margaret, first moved in, and from the late eighteenth century it has served as Edinburgh’s military base. With the audio guide in hand, I found myself spending most of the day wandering around the castle grounds, discovering more about the history of Scotland and Edinburgh Castle. 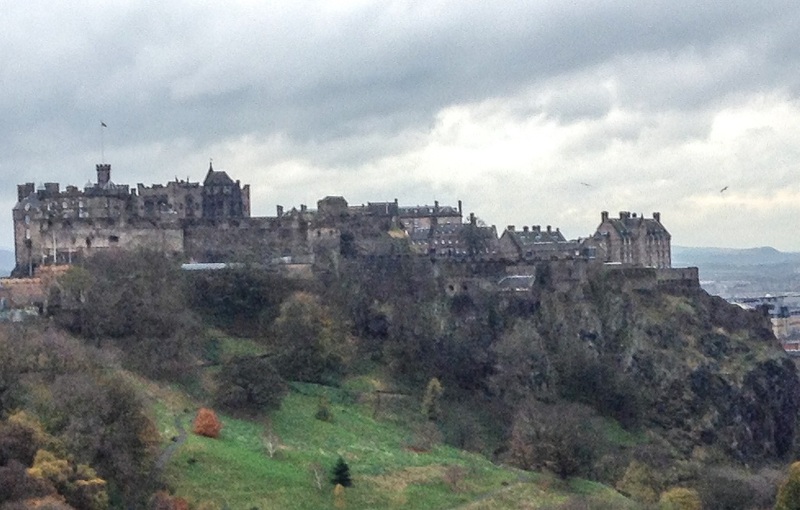 There is much more to Edinburgh Castle than what I had seen on TV. 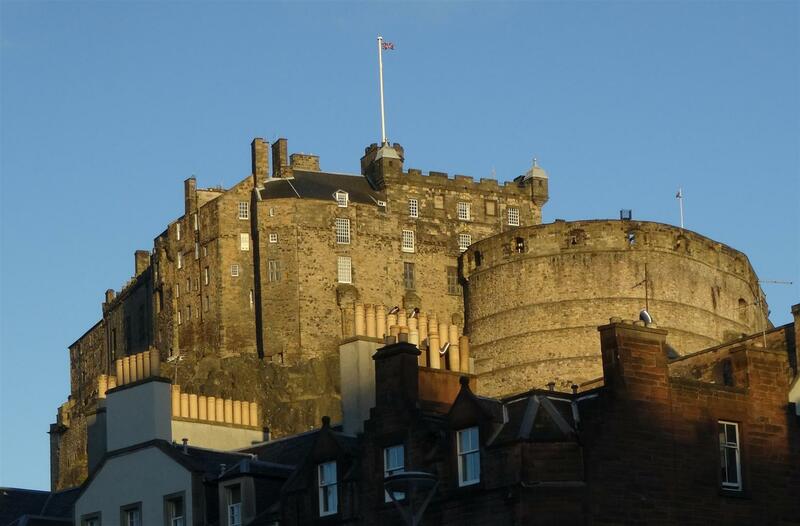 Edinburgh Castle consists of a collection of buildings whose purposes have evolved over the years. There are gates and portcullis to walk through and Argyll’s Tower and the ruins of St David’s Tower to discover. 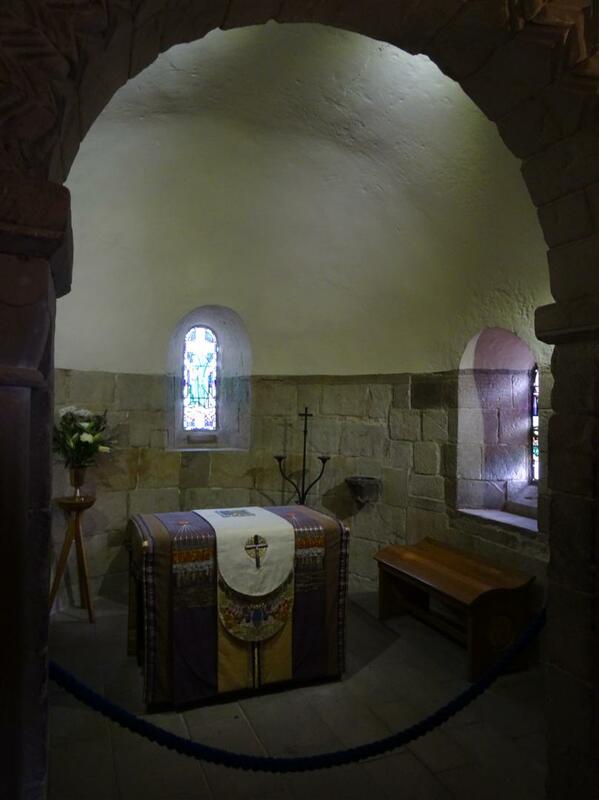 You could spend some time in the cosy St Margaret’s Chapel (where you may have to queue to get inside! 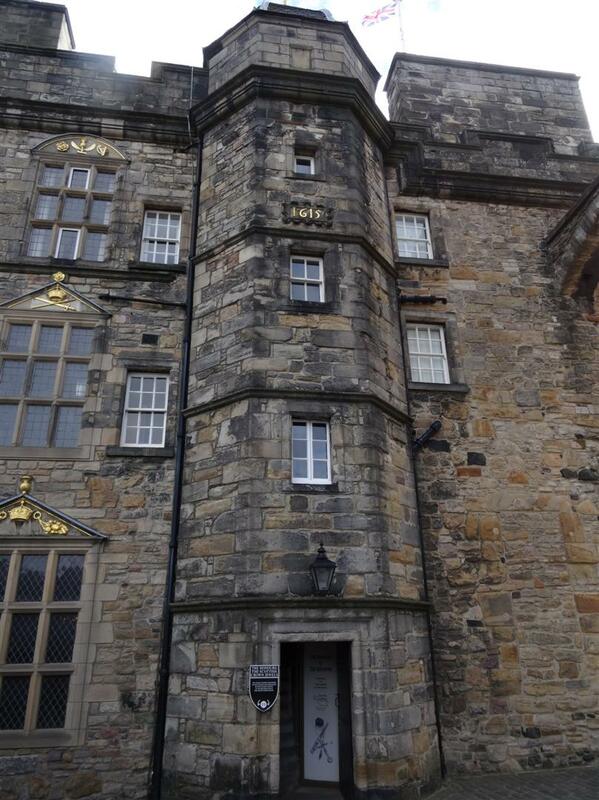 ), which holds the distinction of being the oldest building in Edinburgh. There are batteries, such as the Argyll Battery and Half-Moon Battery, that look over the city of Edinburgh. 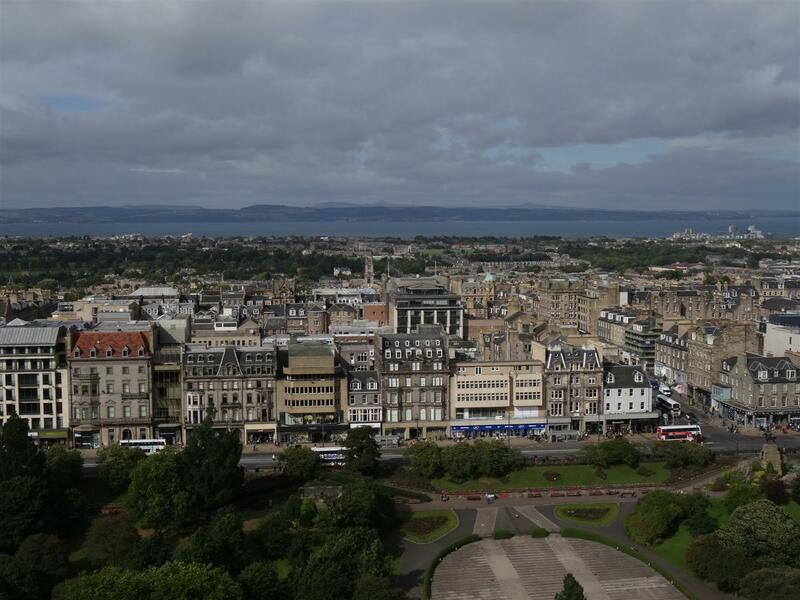 From here you can see the Royal Mile, Princes Street, Calton Hill and out to the Firth. Every day (except for Sundays, Good Friday, and Christmas Day), the one o’clock gun is fired. 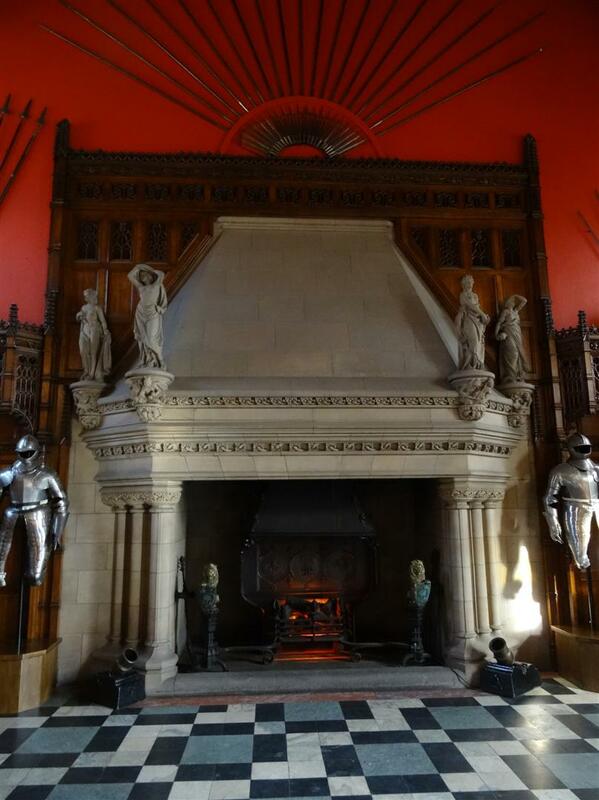 If you’re visiting the castle around 1PM, head over to the Redcoat Café at the Argyll Battery to see it for yourself. The gun was traditionally fired so that ships floating out in the firth had an audible signal (together with the visual clue of a time-ball being dropped at the Nelson Monument on Calton Hill) and could set their time appropriately. While you’re on the Argyll Battery, also check out Mons Meg, a cannon that was used in battle in the 1400s. Into military history? There’s stacks of it here! 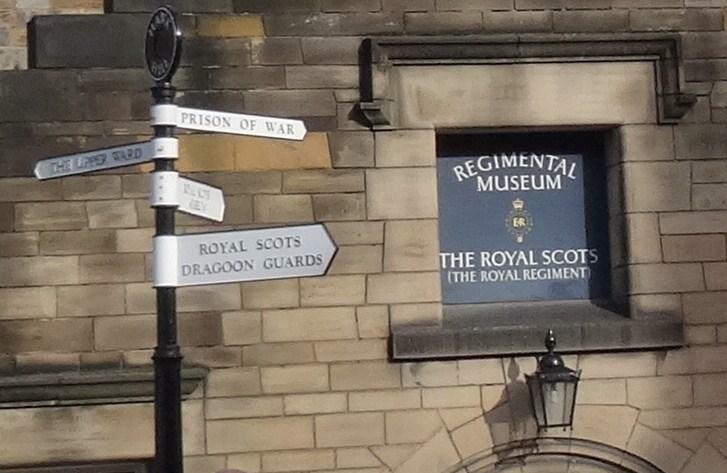 Not only will you find the large Scottish National War Memorial right in the middle of Edinburgh Castle’s grounds, there are several war museums to visit, including the Regimental Museums of The Royal Scots Museum and The Royal Scots Dragoon Guards. There’s also an exhibition about Prisons of War, about prisoners of the Napoleonic Wars from countries including France and America. 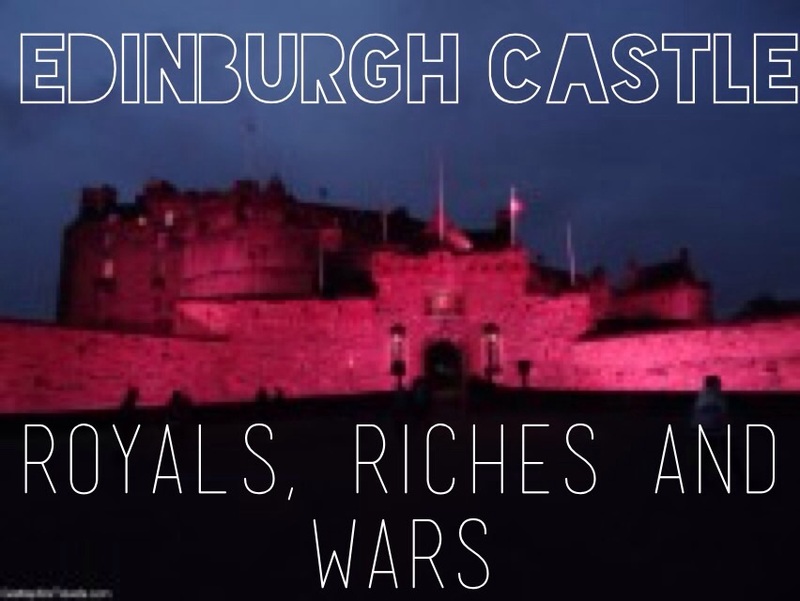 They were held at the castle, and the exhibition tells visitors about the wars and the living conditions of the captured prisoners during their time at Edinburgh Castle. Keep an ear out for the Weaponry talks on the Half-Moon Battery, an amusing story about the weapons used by the clans of the Highlands through to the soldiers in the more recent wars. Finally, tucked away next to the army barracks is the National War Museum, which tells Scotland’s history of war, complete with a display of uniforms, flags, weapons and touching stories of what war was like for the Scots. The medieval Great Hall with its famous hammerbeam roof is lined with striking displays of suits of armour and swords. There’s something surreal about looking at a suit of armour, and imagining wearing it yourself and trying to move around in it. On display in the Royal apartments are the rooms where Mary Queen of Scots lived, as well as where she gave birth to James I, who would be the first Scottish king of both Scotland and England. The rooms themselves are sparsely decorated, with little furniture on display, but that helps you focus on the architectural details. I especially liked the carved white ceiling of the apartments. The Honours of Scotland, consisting of the Crown, Sceptre, and Sword of State are on display in the Crown Chamber and are the oldest crown jewels in Britain. This is the only place in the castle where photos are not permitted. Scottish tour guides love to tell their audiences stories about The Stone of Destiny, which was taken by King Edward I in 1296 and fitted into the Coronation Chair when English kings and queens were crowned, before eventually being returned to Edinburgh Castle in 1996. In the 1950s, while the Stone was housed at Westminster Abbey, four Scottish students broke in and took the stone back to Scotland, where it disappeared until it turned up at Arbroath Abbey a few months later and was returned to Westminster Abbey. And then there’s the greatest joke – that the Stone of Destiny on display in Edinburgh Castle isn’t actually the real Stone at all, but a prank played on the English when they first took the stone from Scotland. Rumour has it that the English were given the stone that was covering up a lavatory, while the real Stone of Destiny was hidden away, meaning that the Kings and Queens of England have been crowned while sitting over a toilet seat! For over two thousand years, Rome has been an ever-evolving metropolis offering art, history, religion, culture, shopping, and nightlife. So when you find yourself in Rome for the first time, what should you see? When I think about Rome, the arches of the Colosseum come to mind. 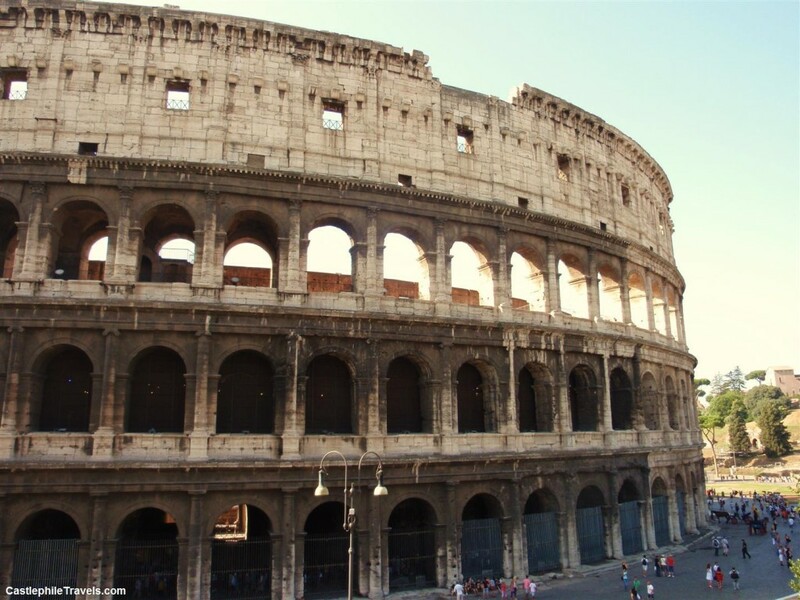 The Colosseum was the largest amphitheatre of the Roman Empire, and the site of sparring gladiators, executions, battle re-enactments, theatrical shows and pagaentry for the tens of thousands of Romans who flocked to it. Forums were the social centre of Roman life. 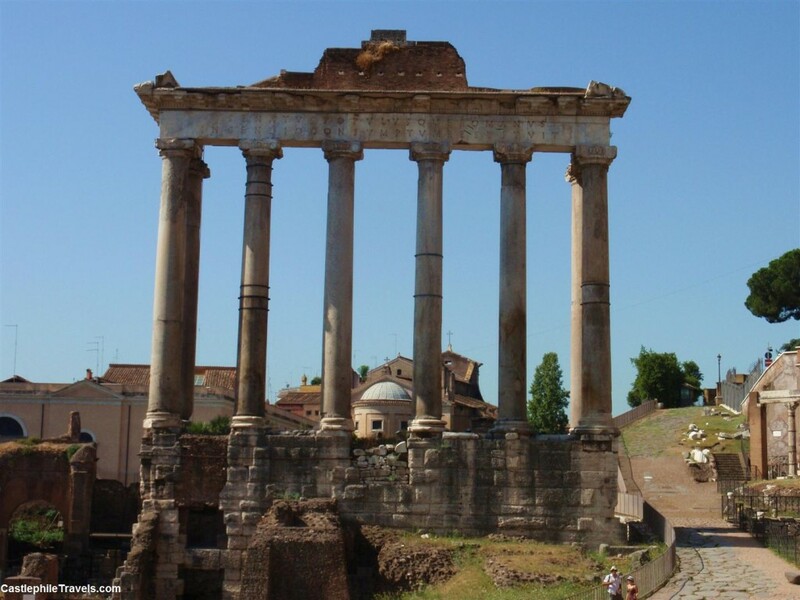 Situated right next to the Colosseum, the Roman Forum was a public space where Romans could shop at the marketplace, worship their gods, and run their businesses, as well as a place for military marches and Senate sittings. My favourite part of the Pantheon? Gazing up as the sunlight filters in. Originally built as a temple for all Roman gods, the Pantheon is now a church. 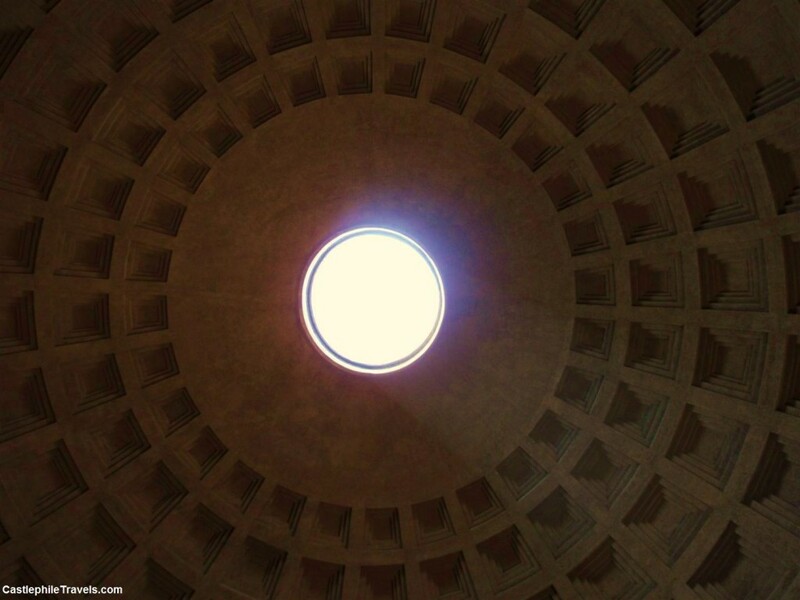 When you’re visiting, don’t forget to look up and watch as sunlight filters in from the opening in the top of the dome. 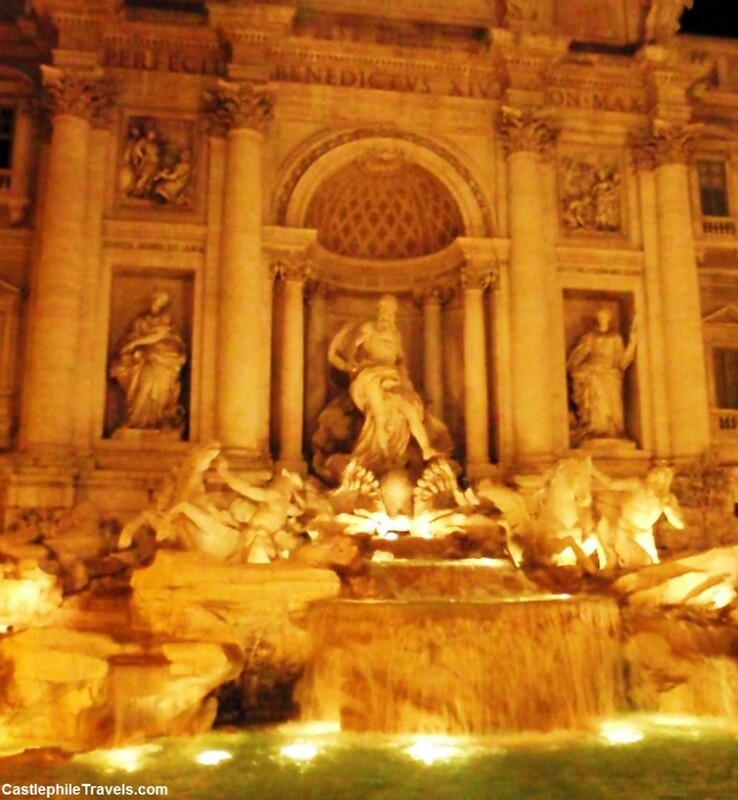 One thing you’ll have to decide as you approach the Trevi fountain is the number of coins you want to throw in. Throw one coin in to return to Rome, two to find romance, and three to get married. The coins that end up in the water as part of this tourist tradition are collected and put towards charities. Built to link the Spanish Embassy to the Trinità dei Monti church, these steps don’t look like anything special. 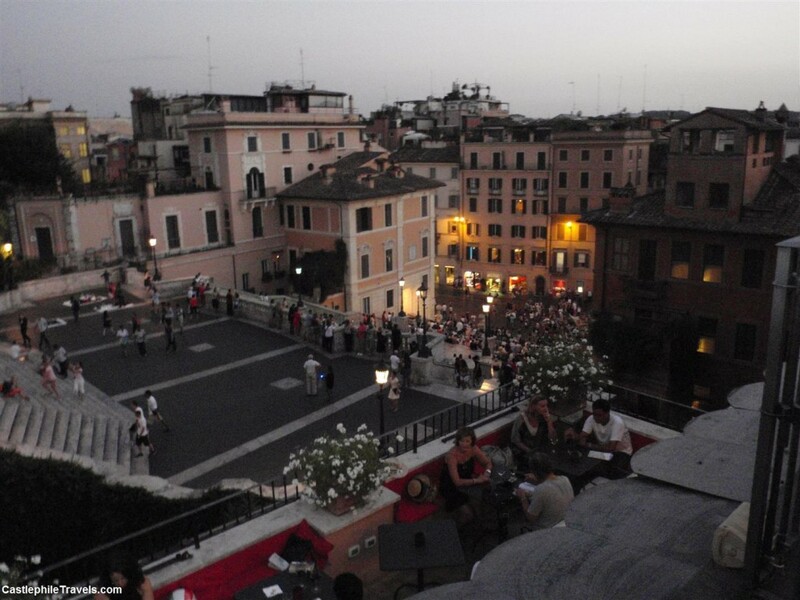 So why are the Spanish Steps on so many people’s lists of things to see when in Rome? Could it be because of their appearances in movies such as Roman Holiday and The Talented Mr Ripley? Or could they just be a good place to sit and people-watch? You decide! 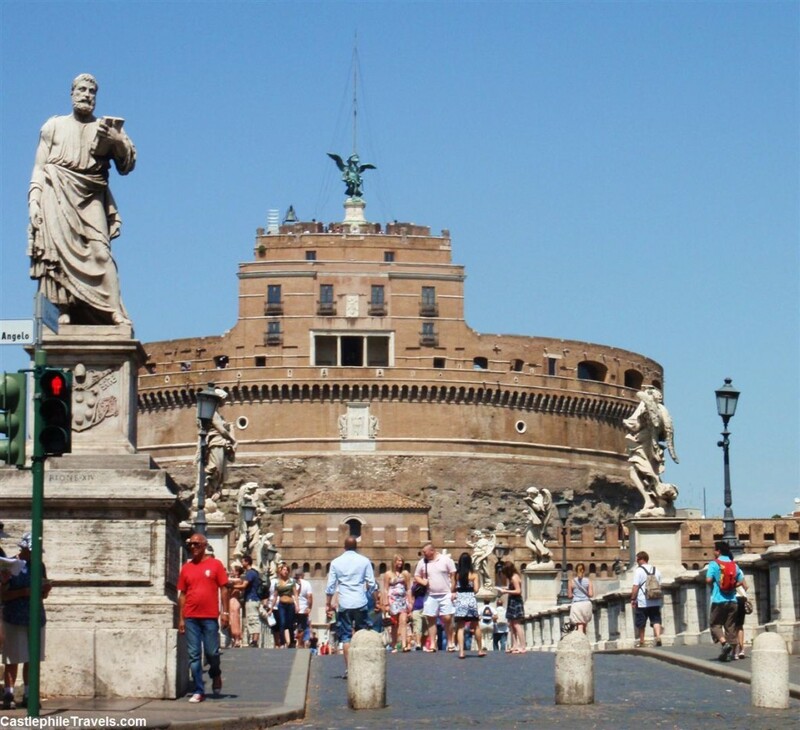 The purpose of the Castel Sant’Angelo has changed over the years. 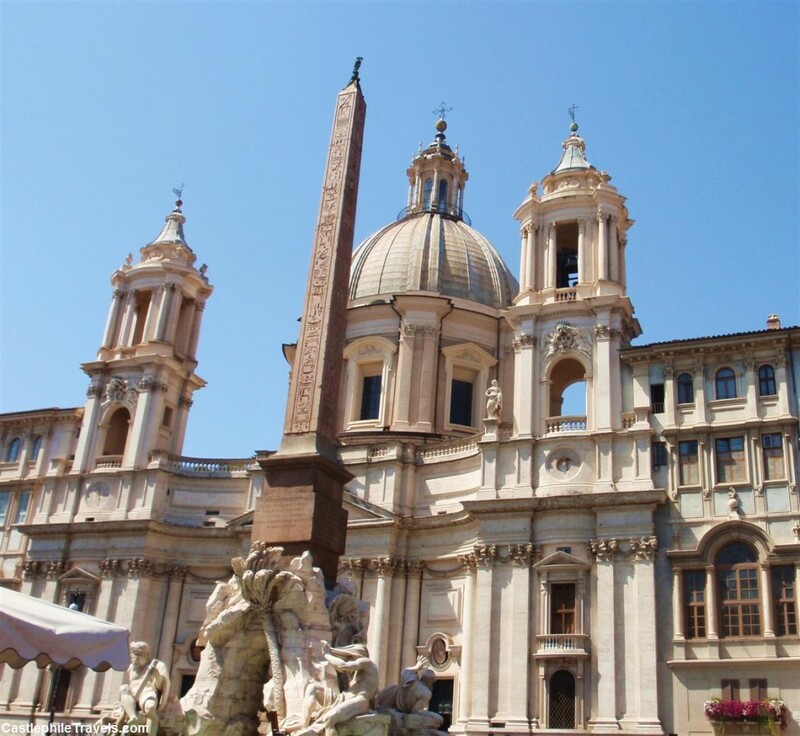 Originally constructed as a mausoleum for the Emperor Hadrian, it has evolved to become a fortress for the popes (and even has a passage that connects it to the Vatican), and is now the Museo Nazionale di Castel Sant’Angelo. 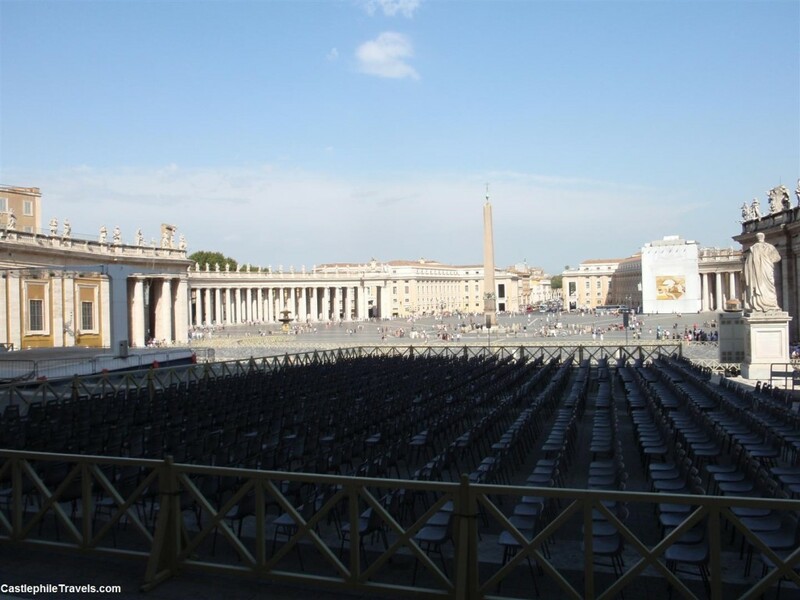 I was surprised to find that the Vatican was more than the home of the Pope, St Peter’s Basilica, Michelangelo’s celebrated ceiling painting of the Sistine Chapel and St Peter’s Square. The city state also contains art galleries and beautiful courtyards, as well as one of the longest escalators I’ve ever set foot on. 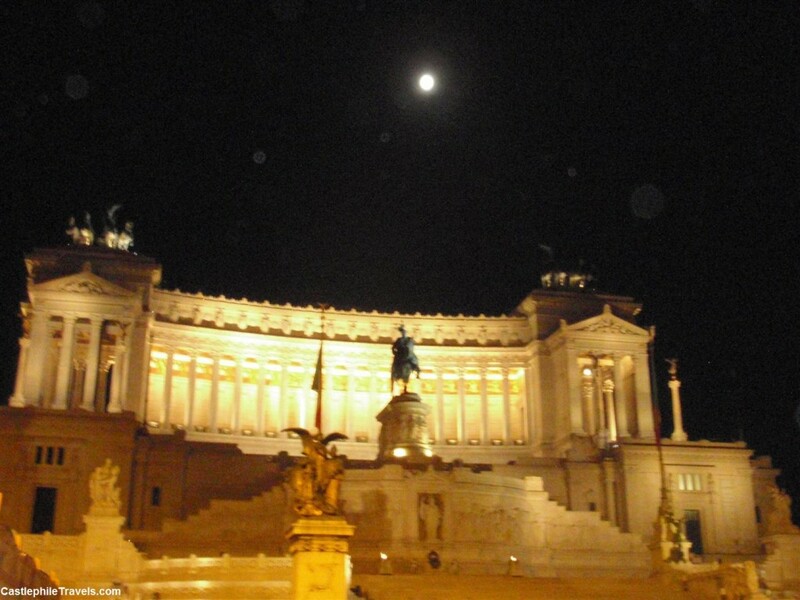 The Altare della Patria is one of those buildings that makes you stop and stare at it. It’s actually a national monument to Vittorio Emmanuele II, the first king of unified Italy, and visitors can access the top of it for views over Rome. Bernini’s Fontana dei Quattro Fiumi (Fountain of the Four Rivers), with the Obelisk of Domitian rising above it is the focal point of this piazza. People-watch at one of the restaurants bordering the piazza and admire the fountains, churches, galleries and palaces that are clustered around the square. Where is your favourite place in Rome? 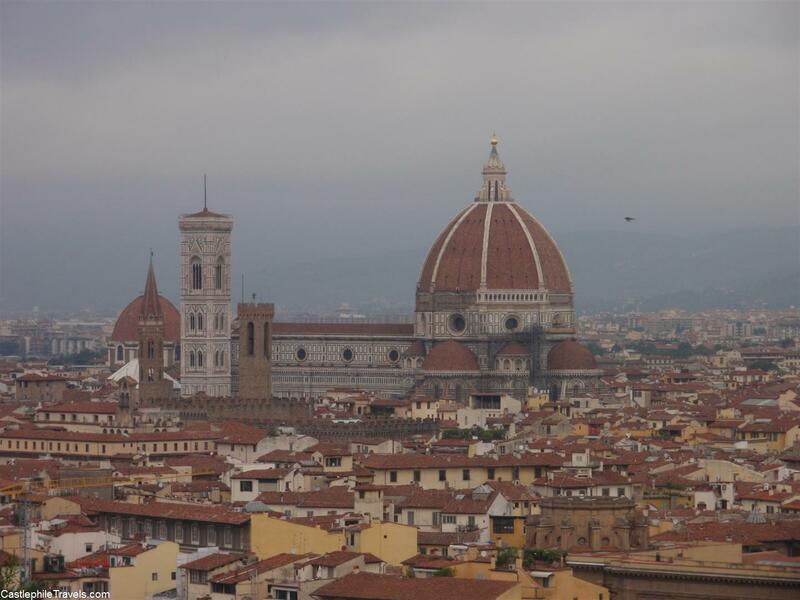 Along with seeing Michelangelo’s statue of David in the Galleria dell’Accademia, one of my favourite memories of visiting Florence was climbing to the top of the Duomo’s belltower (known as the Campanile di Giotti) and taking in the stunning views of Florence and the Florentine countryside. 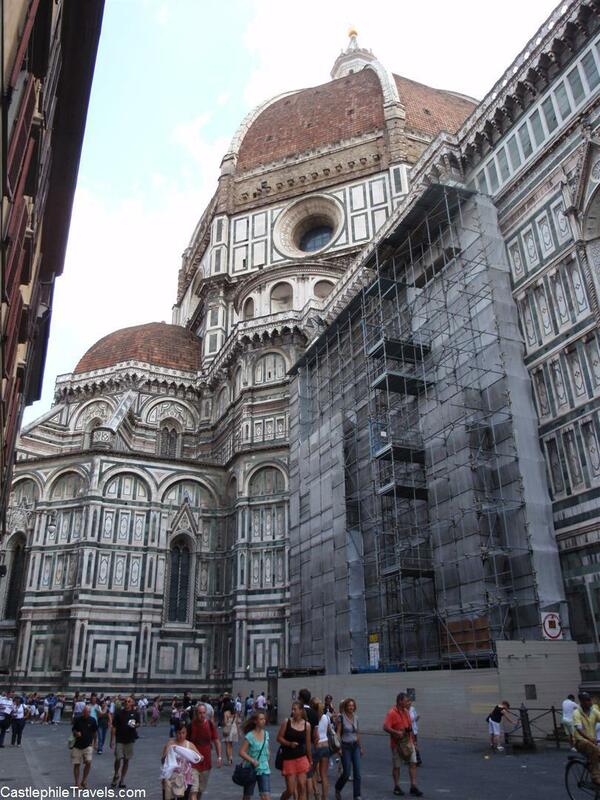 In the Piazza del Duomo – you can see the line to climb up to the dome in the background. 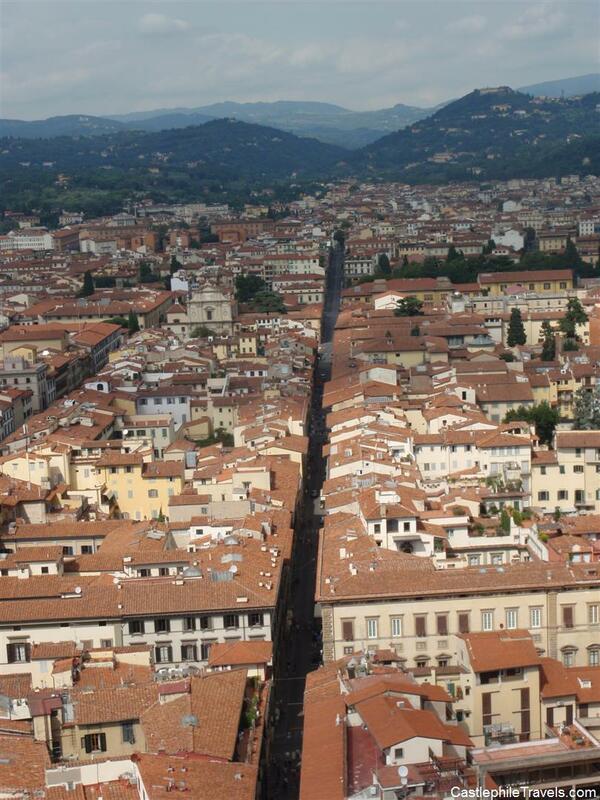 We were visiting in August, when the whole of Italy succumbs to sticky heat. 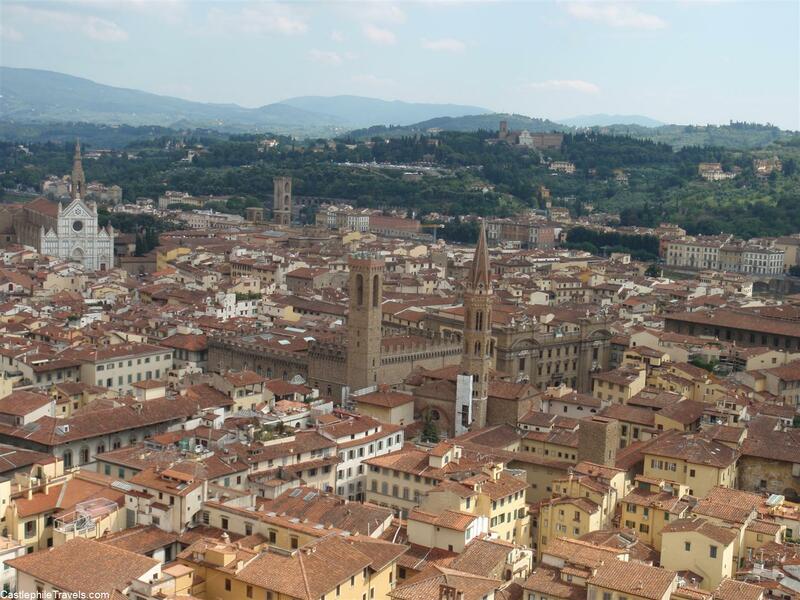 Our plan was to climb up to the dome of the Basilica di Santa Maria del Fiore and we joined the long line of people waving their city maps in front of them in an effort to keep cool. We waited. The line didn’t seem to move. We looked up at the red dome that seemed to dwarf the piazza, and then over to the neighbouring belltower. 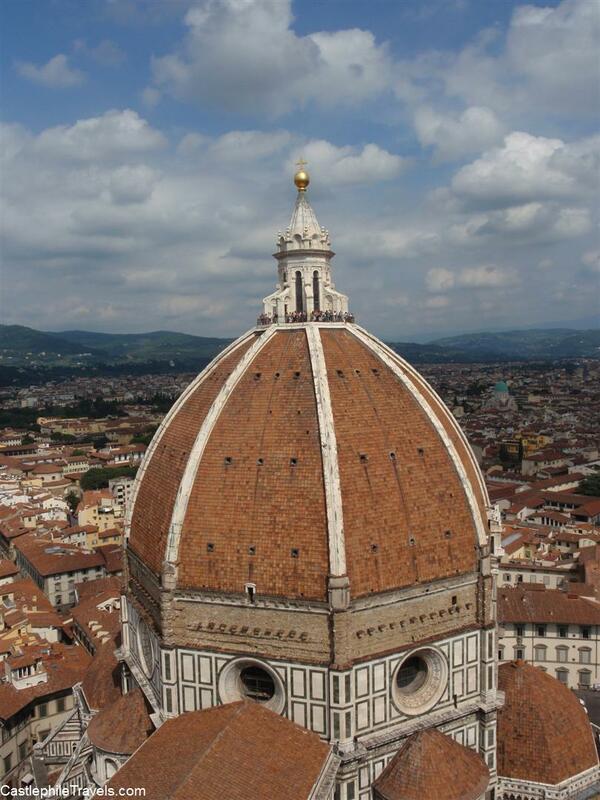 After sending someone over to perform reconnaissance, our decision was made: While there were at least fifty people in front of us in the line for the Duomo, there was no line for climbing the belltower. It was time to give up on the Duomo. 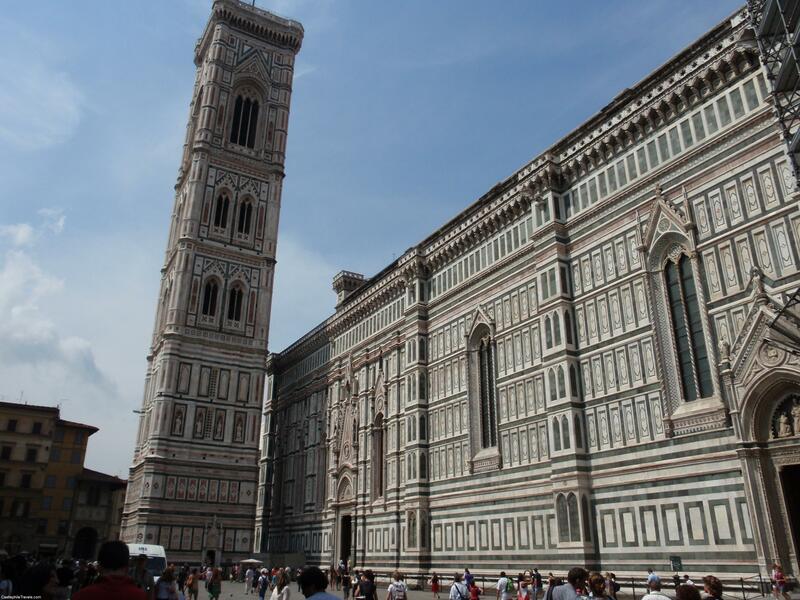 We scurried over to the entrance of the fourteenth century Campanile di Giotti, and felt a welcome relief when we stepped inside the cool dark room that served as the gift shop and ticket desk. We paid our entrance fees, and then the stairs began. They were easy at first, and the climb was broken up by three different landings, allowing you to catch your breath and cool down before attempting the next set of stairs. The final staircase proved more interesting than the others. It was very narrow, and if you met someone on the staircase, one of you had to move back to one of flatter parts where the stairs turned the corner, otherwise it was rather difficult to squeeze past everyone. It was hot, hard to climb, and stuffy. If we’d waited the extra half an hour in the line for the Duomo, we would have been able to climb just that little bit higher. 414 steps later, we finally found ourselves at the top of the belltower. Even though the Duomo’s dome is taller than the belltower, as we looked over at the people standing on the Duomo’s balcony it didn’t feel like too much of a difference. 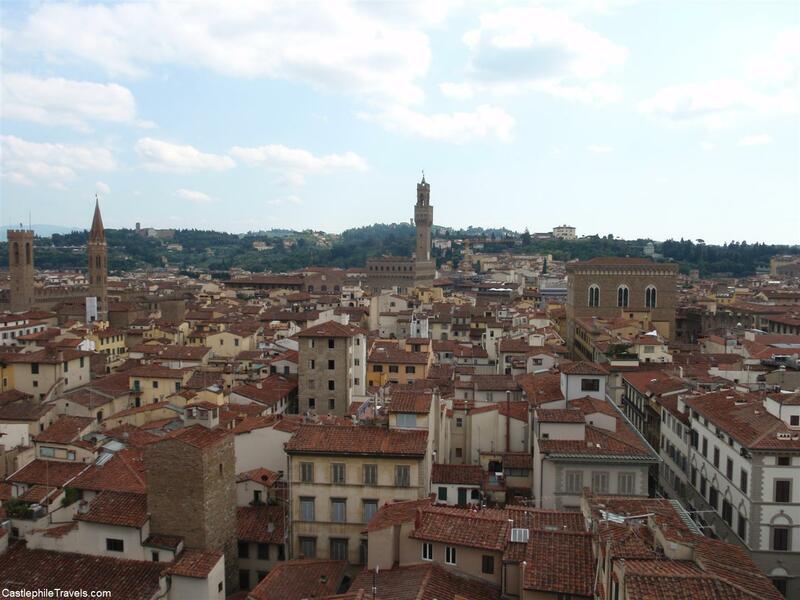 As we caught our breath, we gazed over the red rooves that hid the narrow streets of Florence. Churches and towers poked up between them. Further on, the city fell away to the green of the countryside. Florence is home to narrow lanes where the buildings are so close together that you can walk around in the shade – good for hot summer days! 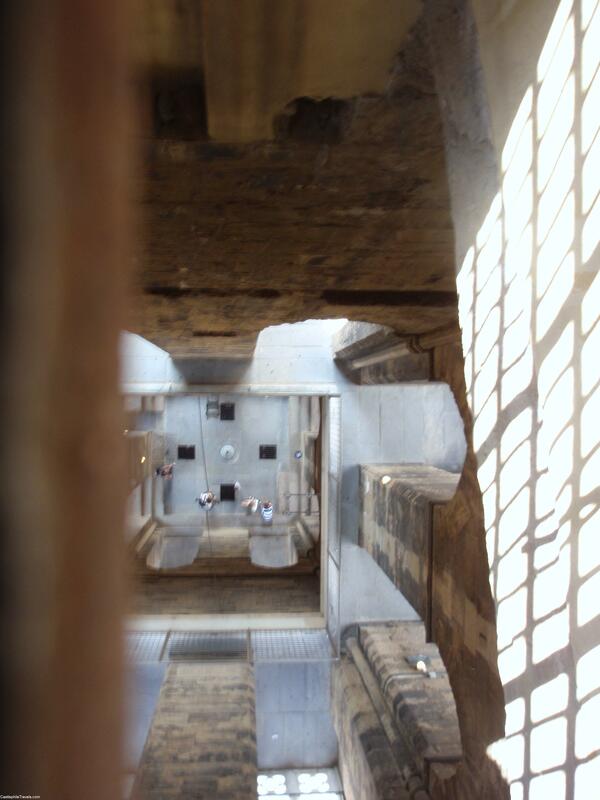 The view from the top of the belltower – down through the middle! The way down the bell tower was a lot quicker than climbing up (though we still had to press ourselves up against the walls as others climbed up and squeezed past us, and I was worried that I’d slip and fall down the narrow stairs!). 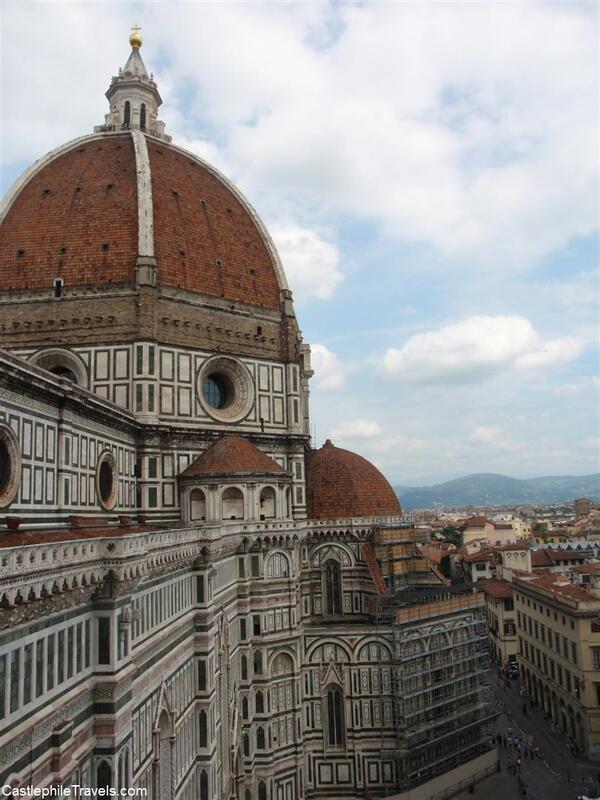 As we set foot back in the Piazza del Duomo and looked back up at the top of the campanile, we congratulated ourselves on a successful climb and then bought ourselves a round of gelati as a reward! Chatsworth House, a stately home in Derbyshire, is best known to me as the setting for Pemberley, Mr Darcy’s estate in the 1995 BBC mini-series of Jane Austen’s Pride and Prejudice. That is why at 10:30am on a Sunday morning we turned in to Chatsworth Road and joined the queue of cars, only to still be creeping forward in the queue an hour later. 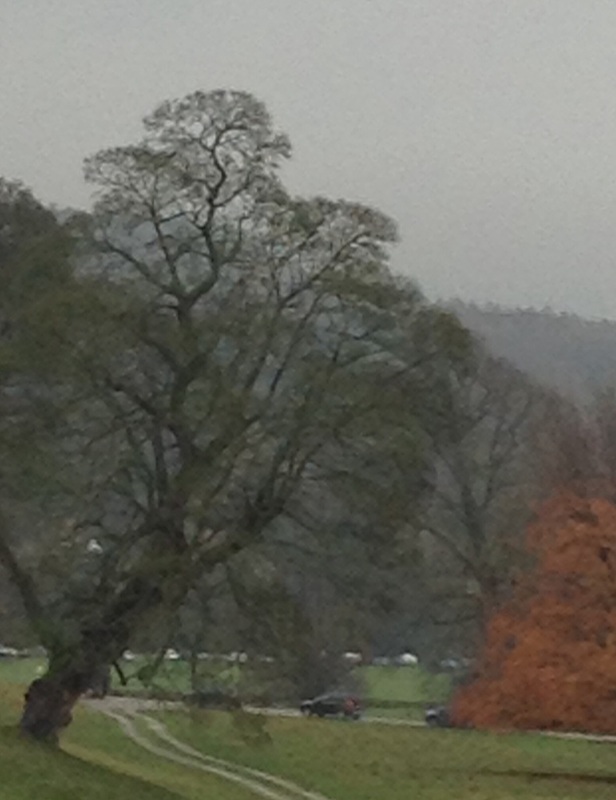 The queue to get in to Chatsworth (and we were following those cars! 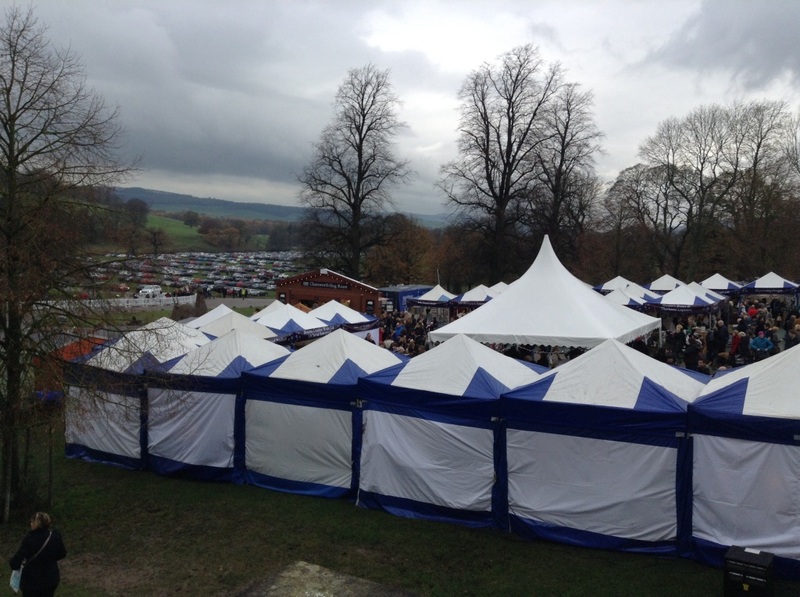 Little did we know that our visit coincided with the first weekend of the Chatsworth Christmas Market – there seemed to be more people swarming the stalls than headed for the House! The Christmas decorations were up inside the house, themed with characters from Lewis Carroll’s Alice in Wonderland. I had to remind myself to look at the house itself – I was so taken with the decorations (my favourite? The Mad Hatter’s Tea Party in the hall!). After walking around the gardens (and getting absolutely stuck in the muddy maze!) we wandered through the busy Christmas markets, had some lunch, and by the time we waded through the mud to get back to our car two hours later, the cars were still queued up to get in! Should you come while the Christmas markets are on? Absolutely. While we didn’t think much of the markets themselves, the Christmas decorations in the house were inspiring and must have taken a lot of thought, effort and care to construct! It isn’t cheap – parking on the weekend inside the grounds costs ten pounds (though we were given a five pound discount voucher against our admission costs to the house) and tickets to the house and gardens sit at 22 pounds. 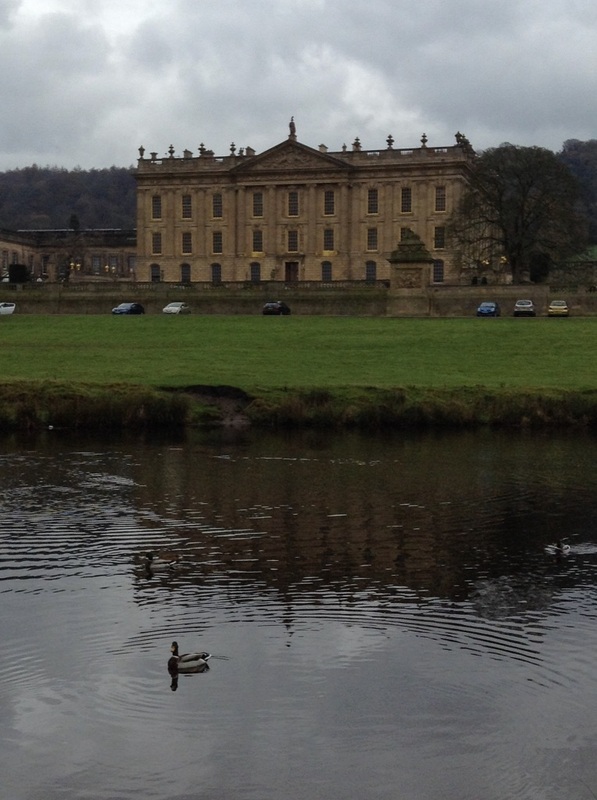 However, if you’re a admirer of stately homes (or of a certain BBC mini-series) it is worth it. Looking for afternoon tea in York? 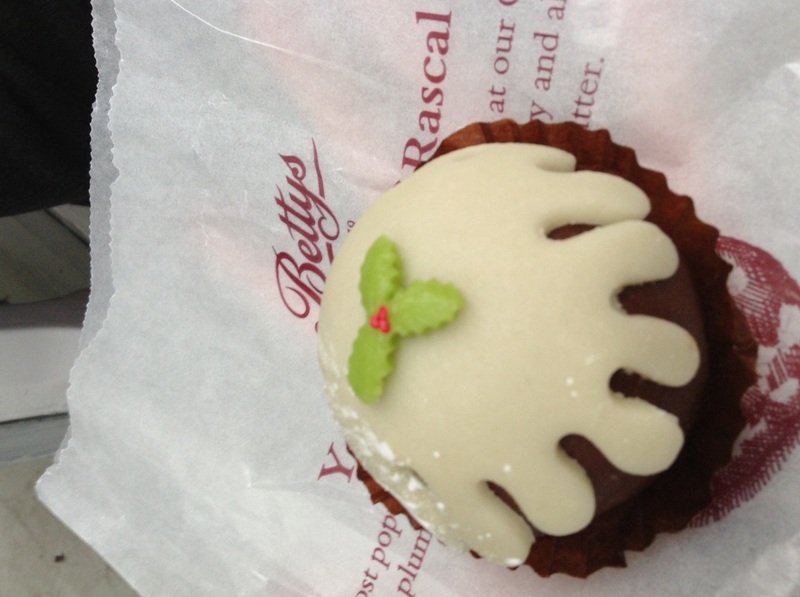 The recommendation you’ll hear the most is to go to Bettys Tea Rooms. Once there, you’ll often be faced with a line out of the door and a wait for a table. The cakes, slices and biscuits are worth waiting for, but did you know that there’s a second Bettys, just around the corner on Stonegate? I thought that the second Bettys was only for take away deliciousness, but when we were there today, I noticed that they have tea rooms upstairs – with no queue in sight! 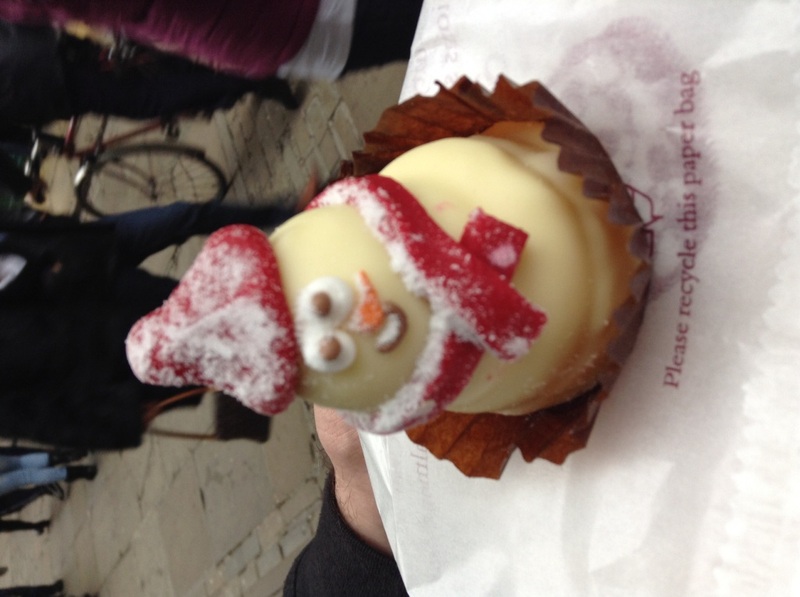 Bettys had their Christmas range out, so we chose a white chocolate ganache snowman and a marzipan pudding to try, and they didn’t disappoint! If you’re in York, go to Bettys Tea Rooms and enjoy. And if there’s a line of people at the main one, sneak over to Stonegate! Ever since I heard that the movie Robin Hood: Prince of Thieves was partly filmed at Sycamore Gap, a section along Hadrian’s Wall, I have wanted to visit it. When I was in the UK last year, I almost booked a day tour that went there, but chose one that went to Alnwick Castle instead. This year, we had a hire car from Europcar, and discovered that it’s quite easy to get to Sycamore Gap – if you know where you’re going. Hadrian’s Wall and Sycamore Gap in particular, appear in the movie Robin Hood: Prince of Thieves as Robin and Azeem (played by Kevin Costner and Morgan Freeman) make their way from the English coastline to Nottingham, where Robin first encounters the Sheriff’s men as they trap Little John’s son Wolf up the tree at Sycamore Gap. Unfortunately, there’s not a great deal of information online, and doing a Google search combining ‘Robin Hood’ and ‘Hadrian’s Wall’ returned plenty of photos but no directions. Northumberland National Park does offer a brochure that includes it in one of their Hadrian’s Wall walks, but doesn’t tell you how to get there. To get there, you need to get on the A69 that runs between Carlisle and Hexham. Once you are in Steel Rigg carpark, you will find a gate at the back of the carpark that will take you through to the walking trail. To your left, you will see a lake partially hidden by some hills – if you see this you are in the right place! Follow the trail (note at some points the dirt and gravel trail disappears and turns to grass) over the first two hills. 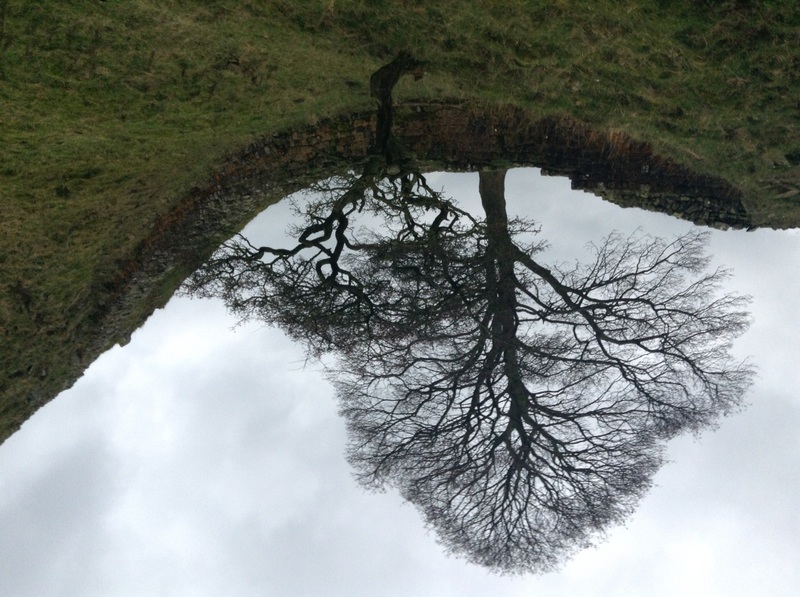 You should come across a ruin of a Roman fort known as Milecastle 39. Milecastle 39 along Hadrian’s Wall. Sycamore Gap is just over the other side of this hill, before the lake. Sycamore Gap is just over the next hill (if you have gone past the lake you have gone too far). The walking trail winds right around the lone tree, so don’t worry, you won’t miss it! 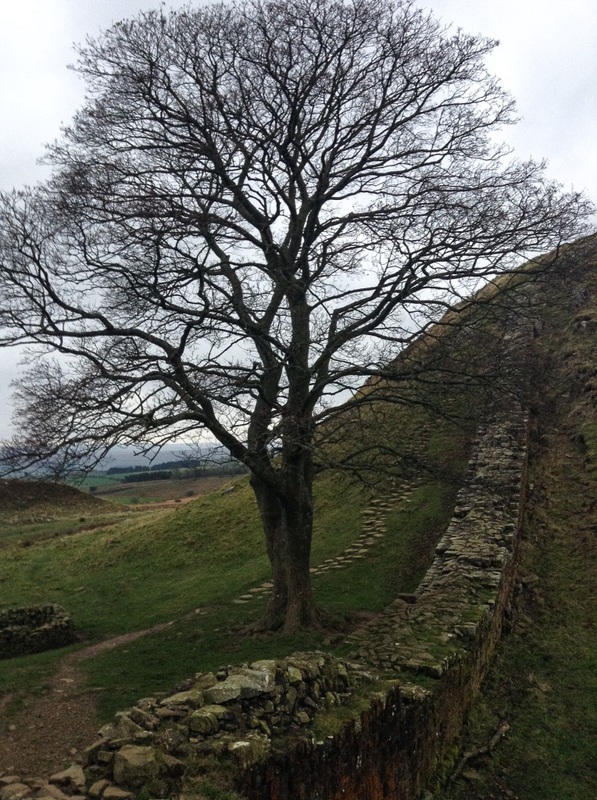 It took about half an hour for us to walk from Steel Rigg Carpark to Sycamore Gap. 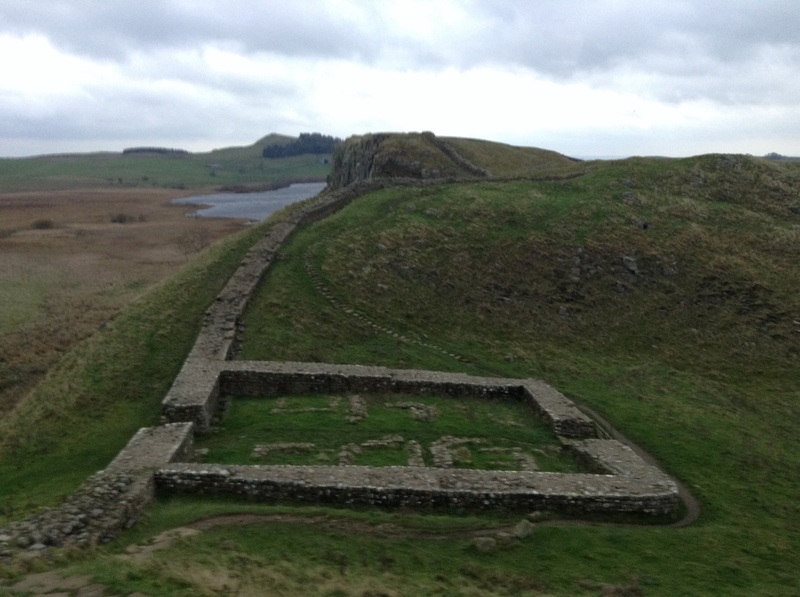 Whether or not you’re a fan of the movie, Hadrian’s Wall and the surrounding countryside is beautiful (even in low light with winds strong enough to stop you from climbing down a hill!). 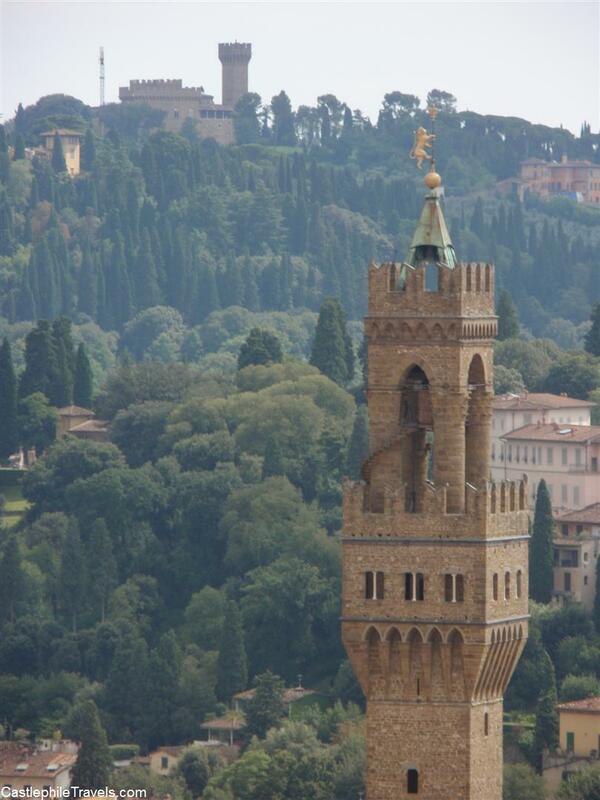 A UNESCO World Heritage Site, it is definitely worth the effort of all of those hill climbs! A lone bagpiper plays Amazing Grace as locals hurry along their way to work. The morning sun is hidden behind clouds that threaten rain. We stand on the edge of the East Princes Street Gardens and stare up at the 200 feet tall gothic tower before us: the Scott Monument. The largest monument in the world to commemorate a writer, the Scott Monument is dedicated to the life and works of Sir Walter Scott, author of Rob Roy and Ivanhoe. From ground level, the top of the Scott Monument looks a long way up, much higher than the advertised 287 steps. 287 steps sounds easy (after all, in the last week we’ve conquered the 366 steps in the Belfry in Bruges and the 387 steps of Notre Dame de Paris, not to mention the 669 steps up to the second level of the Eiffel Tower! 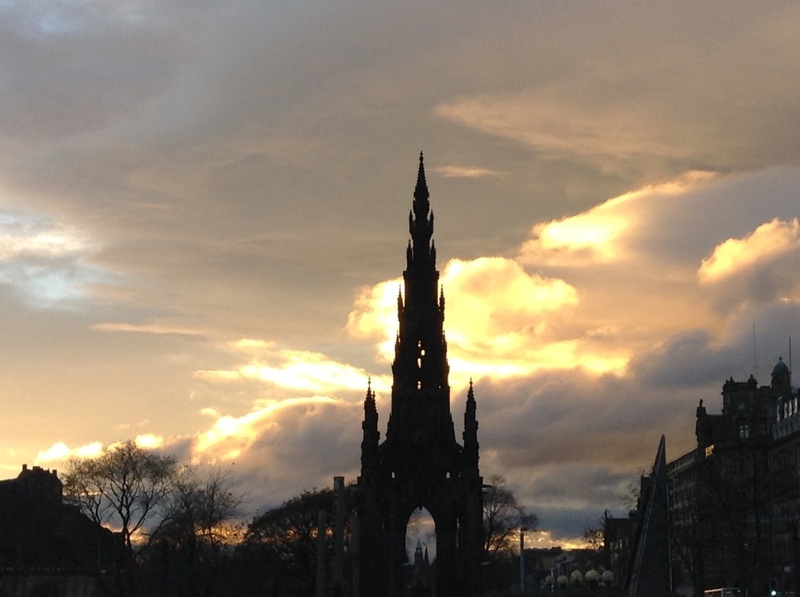 ), but the black spire of the Scott Monument seems like it will take some effort getting to. After finding the entrance and paying the four pounds to get in, we are presented with certificates certifying that we have climbed all 287 steps. My brother suggests we fill in the certificates and save ourselves the climb. Instead, we begin the ascent. Getting to the first of the four levels feels like an achievement. 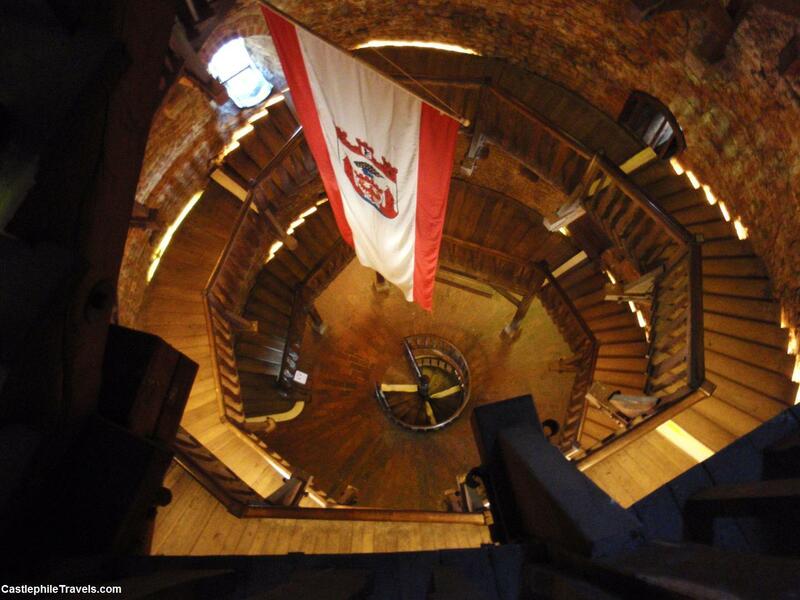 While the stairs start off being wide, by the time you burst out on to the landing, the staircase walls are literally closing in on you: as you climb up the top of one of the towers and the walls become slanted. The view from the first platform is worth the admission alone. You have a 360 degree view over Edinburgh, over to the castle, down Princes Street, across to the North Bridge and Calton Hill and out to the Firth of Forth. There are statues and gargoyles staring down at the people below. On this level, there is also a small museum about Sir Walter Scott and the building of the Scott Monument. The next set of stairs are noticeably narrower than the first, although the third set are wider. It’s the fourth (and final) set of stairs that present a problem. Not only are they narrowest stairs but the ceiling becomes lower, too. My 6 foot tall brother was worried he wouldn’t be able to make it to the top because he wouldn’t fit through the narrowing gaps. Though he did make it to the top, the folks at the Camera Obscura would later tell us that a Welsh rugby player hadn’t been so lucky, and needed the fire brigade to come and rescue him when he found himself stuck in the Scott Monument! It is a bit scary – even though there is a sign at the entrance that you should keep to the right when passing other people on the stairs, you begin to hope you don’t meet anyone coming the other way, because there just isn’t enough room in the stairwell to push past someone, and you don’t want to go all the way back to the previous level only to climb more stairs! The stairs are all part of the fun, and can easily be forgotten once you’ve made it to the top and can look over one of the best views in Edinburgh (and earned the right to fill in your certificate)! 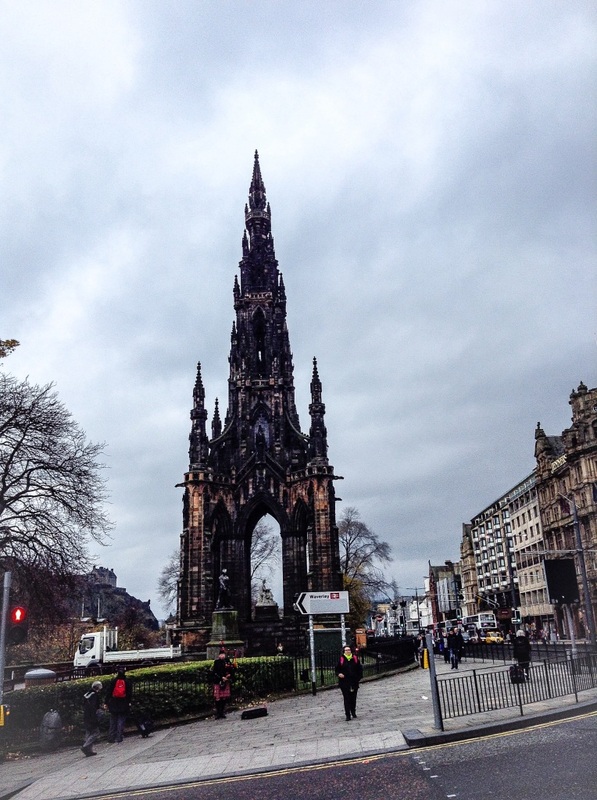 Have you climbed the Scott Monument? Share your experience in the comments – I’d love to hear what others thought!